Dangaard, God-Beast of Wind, was fought first. Dangaard wasn’t bad, actually, despite having four phases. There were some differences in each one, and the phase transitions helped make the fight feel like it was actually moving along. Solid battle, that. No complaints. If you’re having a hard time making out what’s going on here, it’s okay. So did Troy. Xan Bie was number 2. Xan Bie took entirely too goddamn long. His main gimmick is that the furnace thing heals him for 999 periodically. It took some time for it to register to me that there were two targets at all, which is probably at least partially on me, but I feel like it could’ve been a bit more apparent – especially since the little infobox that shows spell names and whatnot pops up over top of the thing. The gimmick’s execution made sense, but the fight took ages even after figuring it out. The furnace just had too goddamn much health for my tastes. Xan Bie’s other gimmick is that his attacks reduce your max health, to a minimum of 100. This is temporary, cured by death/revival or the end of battle, and it made things… interesting. In particular, our healer – Paladin Duran – was actually able to keep up pretty easily because health numbers were so low. Fiegmund was 3, and I would just like to say his weakness made no sense. The water god-beast, with distinctly fishy fins, in the Labyrinth of Ice Walls, should be weak to fire or wind (lightning), right? Nope! Dark, as far as our testing could determine. Immune to fire. I’m not sure what’s up with that. His gimmick was jumping around to unreachable positions and using damage-over-time effects. You could hit him with spells or techs. Solid gimmick, and by this point every team should have some decent spell output, especially since Sin of Mana gives you MP regen. No objections, would make godbeast sashimi again. Mispolm. Mispolm is absolutely abhorrent. There are some very interesting things about him – he seems to be weak to techs, taking 999 from Duran’s and Hawk’s (and I’d been building Rogue Hawk as essentially a mage). Near-immune to all the magic we threw at him (including stat loss), but taking plenty of physical damage. He has two gimmicks, though. The first one is status effects. Sleep, silence, poison, petrify, moogle, chibikko – basically, all of them except Snowman. Full-party, in many cases (more on that in a bit). The second is a Thorns effect. Fans of Diablo 2 are familiar with the notion – you hit, you take damage. Oh, but Mispolm gets creative about it. Because it’s not always that. Sometimes you just get petrified. I now, in hindsight, suspect that his casting of Stone Cloud on himself was intended as the tell for the petrify counter, but it’s not something we could make any sense of as it was happening. Probably in part because that was our first time seeing the spell, and even then I knew that wasn’t the normal effect. This recurring full-party sleep sets up a full-party Grenade Bomb, which is a full-party Chibikko. Now, returning to the bit about status in general, we were doing two-player. 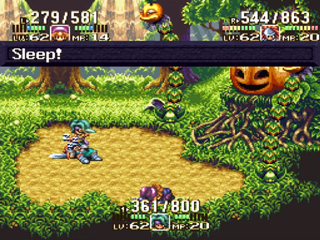 In Seiken Densetsu 3, if the character you’re controlling is incapacitated – dead, petrified, asleep – you get forced off to another character. In single-player, this isn’t a big deal. In two-player, if everyone, or all but one, are incapacitated, player 2 just gets dropped entirely and has to rejoin. This seems minor, but in the middle of a boss fight can be quite jarring – especially with Mispolm since who gets which character is almost random with how many status effects are getting thrown around. Only through digging through the documentation have I found a setup that resists all of this crap. With a very specific set of armor, helmet, and accessories, you can in fact be resistant to all status effects. The problem with that is that this leaves you with limited defenses, and between the thorns and one head munching on Duran for over 300 damage, that’s kind of an issue. Equipment shuffling is kind of a central part of Sin of Mana, and to an extent I like the concept of preparing for a given fight. 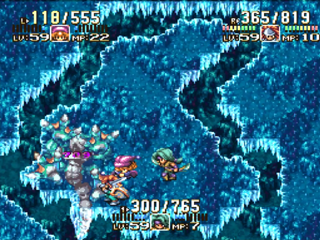 The problem is that there’s an inherent trial-and-error aspect to that, since the included documentation is completely useless regarding bosses with only vague hints that don’t make sense until you’re already fighting, and Seiken Densetsu 3 has a limited “active” inventory and a secondary storage thing that’s just pointlessly slow to access for some reason. This seperation makes sense for items, but equipment can’t be changed in combat anyway so I’m not sure why they did that. In a game like Final Fantasy 6 with a large, readily-accessible inventory it wouldn’t be so bad, but SD3’s menus are just weirdly slow and cumbersome, making any equipment changes more annoying than they should be. This isn’t the modder’s fault, of course, but I feel like it should’ve been a consideration. Mispolm’s spells will also sometimes just randomly hit someone for 999 and there’s nothing you can do about it. So that’s nice. Mispolm, as you might guess, is right about where we… let’s be honest here, ragequit. It wasn’t fun for us and I doubt it was interesting for the audience. I may give the mod another shot somewhere down the line with one of the easier patches, but it’ll be a single-player thing. The mechanics of SD3 don’t work as well for multiplayer as I had hoped. There’s enough about the mod that I like that I want to give it another shot, but… it’s got some issues. Still, I can’t say you shouldn’t play it, just understand going in that it’ll be a clunky experience. The patch is available at New Game Plus, if you’re interested.